One of the appetizers famously served in many a New Orleans restaurant and goes back to the days of Antoine’s Restaurant. Founded in 1840 by Antoine Alciatore this dish was created by Jules Alciatore in 1899, the son of the restaurant’s founder. The dish was named after John D. Rockefeller, the richest American at the time and follows in the same richness of the sauce. The original recipe is still a secret today, however the main ingredient that most folks use today is still spinach, and some opinions differ on the other green ingredients but guess at them being parsley and watercress that are pureed and added to the mix. Historically, it seems the original recipe may have been taken to the death bed of Jules Alciatore, as current Antoine’s chefs deny any spinach in the recipe, some folks support the notion that the primary ingredients are parsley, celery, scallions or chives, olive oil, and capers. The historical mystery surrounding this famous dish still thrives today, but the version presented here from the Columns Hotel as it was served in the mid 1980’s curing the Chef Chris Canan and Brian Coates days, still holds as a superlative addition to any restaurant menu. If you are visiting New Orleans, especially now during Mardi Gras season you can still order Huitres en coquille a la Rockefeller (notre creation) $12.00, Oysters baked on the half shell with the original Rockefeller sauce created by Antoine’s in 1889 at Antoine’s Restaurant. 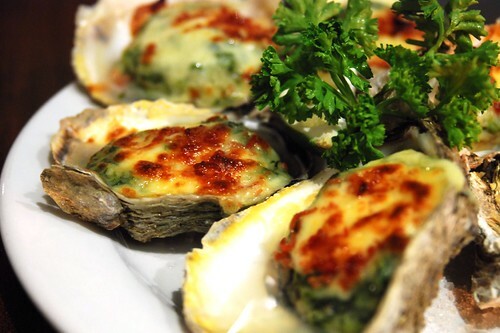 Raw oysters on the half shell are covered with the Rockefeller stuffing/sauce and then typically are topped with cheese and then baked in a high heat oven until browned. Alternatively, roasted for about 15 to 20 minutes in a 425° F oven. Also, typically once baked a hollandaise sauce is dolloped on top of each oyster and then browned quickly under the broiler before service. The recipe below makes quite a large batch, so you may want to cut it in half, or you can freeze any left over portions for several weeks. 1. Thaw the spinach if frozen and drain well. 2. Pass the spinach through a meat grinder and press it to remove any extra moisture. 4. Sauté the onions, celery, garlic and bay leaves in a small amount of oil until soft. 5. Add the liquor and flame. 6. Add the cayenne, fennel, and dry mustard and Worcestershire sauce and stir well. 7. Add the Velouté sauce and stir well then heat through for 15 – 20 minutes. 8. Remove from the heat and fold in the spinach, then transfer to pans and allow to cool over night before using. Can be frozen in 1 lb portions for future usage. Oh, what a classic New Orleans dish this is! We honeymooned in New Orleans many years ago and Oysters Rockefeller was one of the things I enjoyed most on that lovely trip. It would be so nice to visit and enjoy it one more time. Kidding, of course! This looks like an excellent dish. Popa Trix and I had Oysters Rockefeller for an appy at Antoine’s. Delish, but you’re right – they are SO rich, it was more like having a main course! Well, that’s Creole dinners for ya … you gotta space it out slll—ooo—wwww–ly. Or else your tummy will pop! Such a quick response, thanks folks! I might add that the texture of the Rockefeller stuffing/sauce is much smoother if you puree the onions, celery, and garlic before the saute stage in step 3 of the procedures. @MyMan’sBelly, no video that I have done, but shucking oysters does take some practice and skill. I use a damp kitchen towel and wedge the oyster between it and my hand, then use the oyster knife to wedge the two shells apart. Great recipe, I love oysters, This would be nice for a date dinner. Those oysters look scrumptious! I love oysters!! My husband won’t go near them…lol. Oh Chef, these sound fabulous!! This was something that our whole family ate when we visited this small seafood joint in Maryland. Fond memories of great seafood! I love Oysters Rockefeller! Of course we had it in Antoine’s and were trying to guess the secret ingredient. What do you think it is? I can have a dozen of those quite easily. Always one of my favorite dishes. Delicious looking oysters. And any sauce that you get to set in fire is awesome in my book. @My Man’s Belly… I used to shuck oysters professionally, and if it helps, you need not keep your knife very sharp. It’s more of a prying tool, really. I slipped up dozens of times, but because the knife was so dull, I never broke skin. I love oysters rockefeller and yours look delish! I had Oysters Rockefellar for the first time on NYE and they were fabulous especially when using fresh oysters from the bay. As much as I love love love natural oysters, I think I could very easily eat at least a half dozen of these, they look incredibly moreish. I’ve never had oysters rockefeller, but I’m very interested in trying to make some after seeing yours, Yum! LOVE Oysters Rockefeller. Your photo is mouth-watering. Yum.